To the extent that the bailout shores up existing home prices and its paper, it delays the inevitable. It does not assure the early return of buyers. 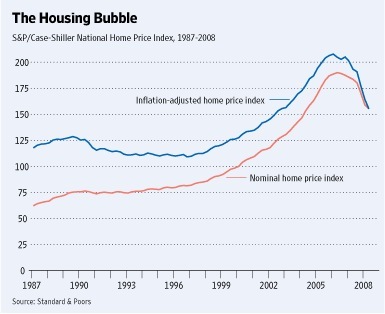 Look at the course of home prices since 1987 in the nearby chart. Do you think the price decline has run its course since it turned the corner in 2006, then plummeted in 2007-2008? Shoring up prices to prevent a further debasement of overly generous loans is not designed to bring back buyers of homes and mortgage paper. But there is good news: homes, stocks, crude oil, copper, corn, soy beans, wheat, lumber and even ethanol are now cheaper. Next Next post: Doing the right thing?